It’s Thanksgiving time! Time for getting together with family and friends, sharing good times and having a delicious hearty meal. I was invited to an early Thanksgiving potluck last Saturday with over 60 people in attendance. All the traditional tasty Thanksgiving items were there – turkey, mashed potatoes, stuffing, cranberry sauce, pie and more! 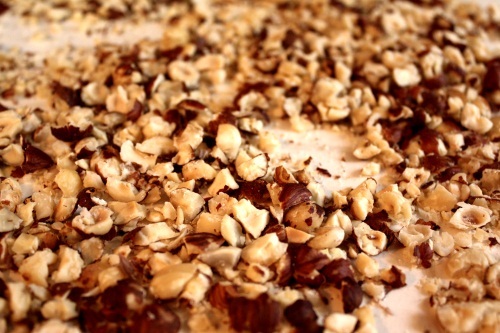 I wanted to make a healthy and flavorsome accompaniment to share with all the yummy, yet heavy food. This carrot salad was the answer. The inspiration for this salad came from something I tried recently at a local Russian restaurant. It was mixed with beets and mayonnaise and flavored with dill and walnuts. 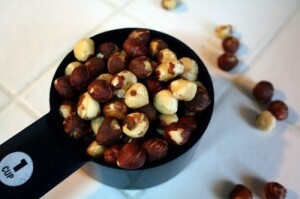 My version uses light mayonnaise, hazelnuts, dill and parsley. 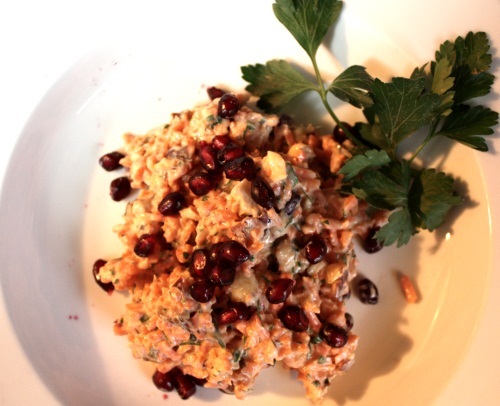 The pomegranate seeds give it a delightful crunch of sweetness in every bite. This salad tastes light yet decadent. One bite and you won’t believe that it’s actually good for you! Thank you to my friends Mary and Jackie who organized the potluck. It was such a wonderful evening full of smiles and heart-warming laughter! Combine the mayonnaise, sour cream, sherry, garlic, salt and pepper in a medium bowl. Cover and chill in the refrigerator until ready to assemble the salad. Boil 2 cups of water and pour over the raisins in a medium bowl. Let sit for 10 minutes to reconstitute. Drain and mince. 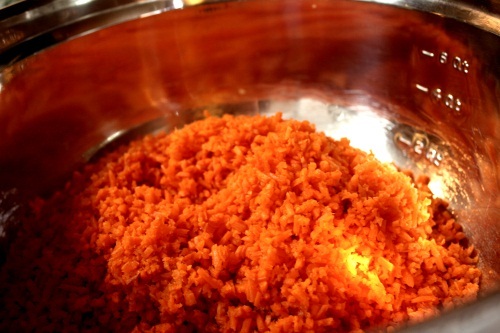 Grate carrots to create a fine crumbly texture in a food processor or by hand with a box grater. Place the hazelnuts between two pieces of wax paper and crush with a mallet or heavy bottomed pan. Combine the carrots, hazelnuts, raisins, parsley and dill in a large bowl. Pour the mayonnaise mixture over the carrot mixture and stir to combine. 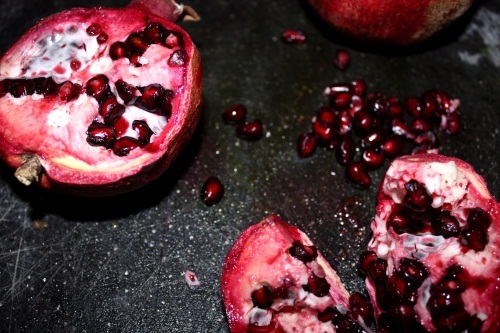 Stir in 1 cup of the pomegranate seeds. 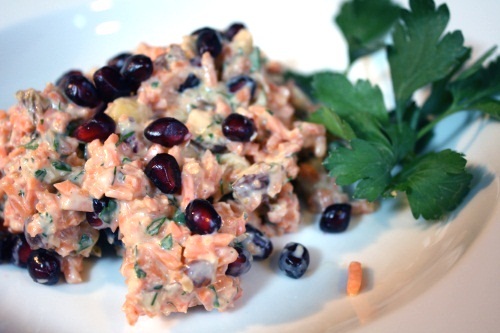 Top with the remaining pomegranate seeds. This salad can be made ahead of time or served immediately. The longer it sits, the more the flavors combine and the softer the carrots become.